This weeks challenge was brought to us by Lyb of And then I do the dishes and she picked the cake that Dorie got fired over. The Chocolate Armagnac Cake. This recipe is so good, and I can see it becoming a favorite in the Chez Us house! I have to say right off, I am glad that Dorie got fired over the creation of this cake – it is FANTASTIC! Basically, Dorie was bored day in and day out of making the same thing and decided to get a little creative when making this cake, in the end, she was fired for being creative! I love that! Not, that you lost your job, Dorie; but, the part about being creative and taking a chance. The past couple of weeks I have made two incredibly dense chocolate cakes that require very little flour if any at all, which I find interesting as the texture is really amazingly light, so different from your tradition cake. This particular recipe calls for bittersweet chocolate and I used the deepest I could find, Scharffen Berger 70% as well it uses ground pecans. I did toast the pecans a bit before grinding which gave them a nice toasty and warm taste. As well we got to flambe prunes in Armagnac, this is the second recipe of Dorie’s that I have gotten to flambe and it is a very fun addition to your baking afternoon. Now you may be thinking to yourself, prunes in a cake? This addition made the cake incredibly moist. The cake is frosted with a simple glaze of more chocolate, very little sugar and butter. This is a recipe that will become a fall back onto for us. It was ultra moist, dense, nice bite of deep bittersweet chocolate and not overly sweet. With the addition of prunes, we like to think it is healthier for us as well, after all, we all could use some fiber with our chocolate! It really is a fantastic recipe. Be sure to check out all the other wonderful Tuesday With Dorie bakers and you can find the recipe here. 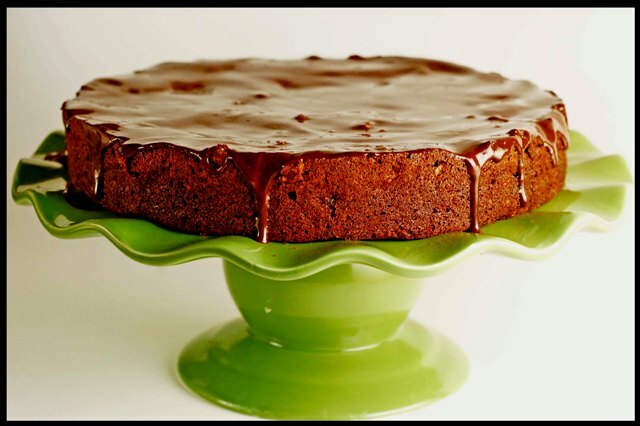 12 Responses to "Chocolate Armagnac Cake"
This cake looks just gorgeous! I love that cake stand! Isn't this a delicious cake?! Great looking cake. I'm glad she was a creatively insubordinate. Yum, this looks so delicious--gorgeous photo! Wow! This looks wonderful! And that stand is beautiful! Wow, I never knew the story behind this cake... thanks for sharing it with us! And it looks simply gorgeous! This cake is giving me all kinds of delicious memories! Chocolate and armangac? Sounds like heaven!!! I'm glad you liked this one, it's truly one of my favourites! I've fallen in love with the prune and armagnac combo! Wow, beautiful presentation - that cake looks scrumptious, and I love your cake stand! Gorgeous photo of a delicious cake!